The MS in Clinical Nutrition is focused on core nutrition, clinical nutrition, professional skills, and electives. This is advanced learning at its best, and is ideal for people with a strong background in clinical nutrition, confidence working at the graduate level, and a commitment to become a leader in clinical nutrition and dietetics. The curriculum is designed to prepare students to translate research; recognize and formulate responses to evolving developments in clinical nutrition practice, policy, and research; and lead and manage professional teams to design nutrition related services. Health professions have increased educational standards beyond the bachelor’s degree; in fact, the Commission on Dietetic Registration has increased the requirements to be eligible to take the Registration Exam for Dietitians to the completion of a Master’s Degree beginning in 2024. To remain competitive in the field and obtain the advanced competencies and skills needed in the job market, completion of a Master’s degree is becoming essential. Why Clinical Nutrition through the University of Wisconsin-Madison? In achievement and prestige, the University of Wisconsin-Madison has long been recognized as one of America’s great universities. As a UW-Madison student, you will be immersed in the latest discoveries and challenged to think critically. Get ready to be inspired by your instructors, challenged by your classmates, and supported in your desire to learn. 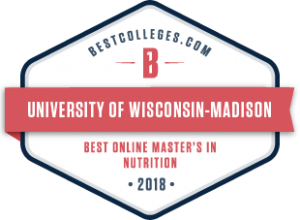 Complete the program in four semesters of full-time enrollment or work part-time on your own schedule; if you already have your certificate in clinical nutrition from UW-Madison, you can finish your master’s degree in just two semesters. Your future is waiting, contact us for more information today!